Czestochowski 21vi/vi. Etching and aquatint on light green paper, full margins. 15 5/8 x 11 3/4 in. ; 39.69 x 29.85 cm. The magical effect of the twinkling Chicago skyline is enhanced by Geerlings’ choice of green paper for this impression. Jewelled City is the artist’s masterpiece and a tour de force of aquatint technique. Geerlings won his first award for a print in 1931, given by the Pennsylvania Academy of Fine Arts for Jeweled City. 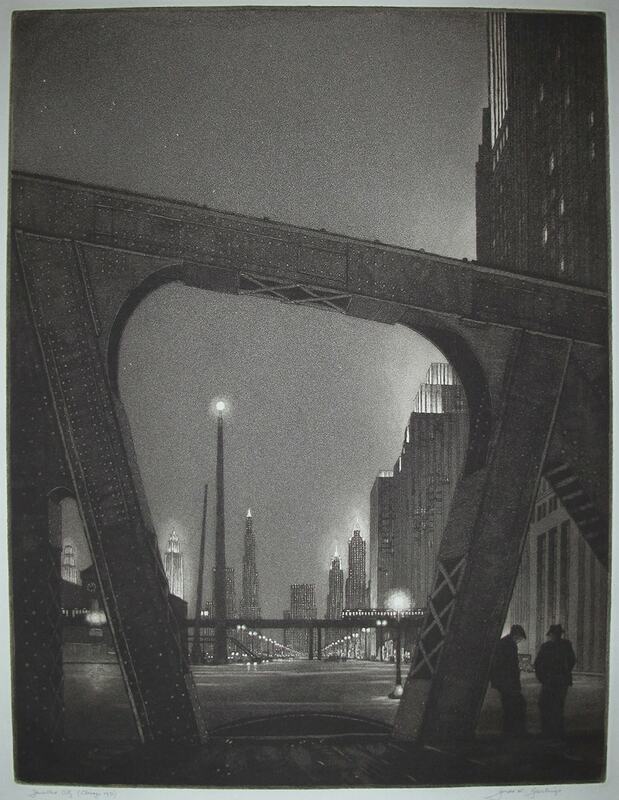 The Chicago view is eastward from Wacker Drive and the Wells Street elevated train crosses in the middleground. Some of the featured skyscrapers are (from left) the Wrigley Building, 1924; Mather Tower, 1928; Carbide and Carbon Building, 1929 and the Pure Oil Building, 1926.